Residents of Hailey are rubbing shoulders more than usual this winter with various animal species that are also in town for the holiday season. Moose, elk, deer and a mountain lion have all been seen in the city during the last few weeks. At least two moose families have been roaming the city day and night, foraging on park lawns and munching willows along the Big Wood River. 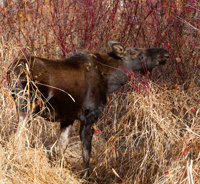 The Wood River Land Trust posted signs warning about moose on a popular path through the Draper Preserve in west Hailey. “Some of us are not as anxious about them as others,” said one pedestrian last weekend while passing by an adult female moose in the Draper Preserve, about 50 feet away. Last weekend, an adult female moose and two calves were seen at Curtis Park near Deerfield subdivision, about a mile from the river, and their natural, riparian habitat. A few days later, four moose were seen together in the Sherwood Forest subdivision. “We got a report of them at Third and Elm streets this morning,” Gunter said on Monday. Gunter said he is regularly notifying the Idaho Fish and Game Department as to the location of wild animals in Hailey. Gunter said he is also providing increased police presence near moose when school lets out, in areas where children could find themselves in close proximity to potentially dangerous animals. Gunter said chasing the moose out of town is easier said than done. “A moose is going to do what a moose is going to do, not what we want it to do. They are stubborn animals,” he said. Gunter said the increased incursions by wildlife into the city limits could be a result of the lack of forage due to the Beaver Creek Fire, which destroyed more than 110,000 acres of forest and brush west of the city last summer. “I think with the Beaver Creek Fire everything is a little displaced right now,” Gunter said. Perhaps more chilling is the sighting by a postal worker of a mountain lion at Lion’s Park, west of town. Gunter reported the sighting to the Jerome office of Idaho Fish and Game. “They said they are seeing wildlife all over the place,” Gunter said. Fish and Game officials trapped and relocated a large mountain lion from just west of the China Gardens subdivision nine years ago. Idaho Fish and Game biologist Lee Garwood has warned pedestrians to stay clear of moose, especially when there are young moose calves present. Although Garwood could not be reached for comment Monday, he said in an interview several years ago that keeping dogs away from moose is also very important, since a moose will charge when provoked. “The worst case scenario is when a dog goes to bark at a moose, gets charged, and then runs back to hide between its owners legs,” Garwood said. Drivers in the south valley should also beware of deer and elk herds crossing the highway, north of Hailey and south of Bellevue. Gunter said he sees a herd of elk 100 head strong in Flying Hat Ranch each morning. Many elk cross the highway eastward during the night to Peregrine Ranch. “Elk are getting hit on the highway in the north and the south,” Gunter said.